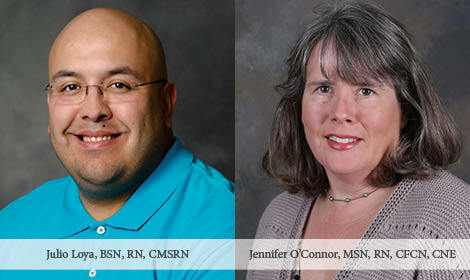 The MU Sinclair School of Nursing is pleased to announce Julio Loya, BSN, RN, CMSRN, of Marana, AZ, and Jennifer O’Connor, MSN, RN, CFCN, CNE, of Broken Arrow, OK, have been selected as National Institute of Nursing Research (NINR) funded T32 Health Behavior Science Pre-Doctoral Fellowship recipients for 2016-2019. As a PhD student, Mr. Loya is studying behavioral interventions to engage Hispanic adults with type 2 diabetes in physical activity. Julio is mentored by Vicki S. Conn, PhD, RN, FAAN, Potter-Brinton Professor of Nursing. As a PhD student, Ms. O’Connor is studying foot care self-management behaviors in aging adults. Jennifer is mentored by Deidre D. Wipke-Tevis, PhD, RN, Associate Professor of Nursing. The Sinclair School of Nursing is one of five departments at MU with an NIH-funded T32 training grant. Moreover, the Sinclair School of Nursing is one of only 16 schools of nursing nationwide to receive an NINR-funded T32 grants. The T32 Health Behavior Science Pre-Doctoral Fellowship provides financial support (stipend, tuition/fees, health insurance, travel to conferences), mentoring and research skill development opportunities to goal-directed, full-time nursing PHD students dedicated to pursuing a research career in health behavior science. Specifically, this NINR-funded T32 training program focuses on health behavior science to prepare the next cadre of nurse scientists who will develop knowledge to change health behaviors that significantly improve public health. Upon completion of this pre-doctoral health behavior science training program, trainees will have the requisite knowledge and skills to conduct rigorous health behavior research, which will significantly contribute to efforts to reduce morbidity, mortality and health care costs by developing knowledge about effective strategies to improve health behaviors.